Not a new arrival at Havran Cottage but a change of view for the blue trailer. And with it idle neighbourly gossip. 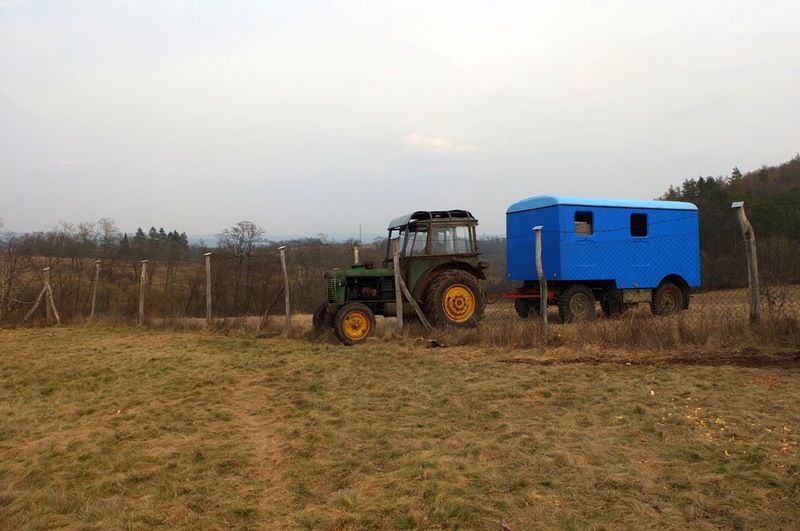 We had a choice of two tractor owning neighbours who both live alone. One being our sweet looking, dirty talking, sprightly elder who had been working his engine over the last month or our negative speaking, shaking head, "you should do it my way", 'hasn't run his tractor since October' neighbour who will talk about you to anyone on his regular friday morning shop in the town. Therefore it was an easy decision. With his tractor worn-through thermals and bobbly hat to fight any cold weather, the consequence was we had the task done in a short time with a glass of wine to celebrate. In the distance the following day we hear the revving of a tractor engine and gushing smoke rising from near our other neighbour's house. As if he was making a point, it's too late to concern us.